New restaurant has hearty comfort food specialties that include all-day breakfast fares and premium entrees. B&P, the newest casual dining restaurant by the Cravings Group, is generating excitement among curious foodies and diners with its unique menu offerings and thoroughly modern takes on well-loved comfort food. From its modest line of freshly prepared food choices, stylish yet very homey ambiance, all the way to personalized customer service, diners will feel at home with the dining experiences that B&P has to offer. This makes B&P one of the most, if not the most, reasonably priced all-day breakfast place in the metropolis. Comfort food at its best, served big, fast, and fresh at any given time of the day is B&P’s mission. Apart from the witty dish names, the restaurant’s unique spin on popular comfort food includes ‘gourmet’ renditions–that is, in terms of the fancy presentation and the amount of high-quality, mostly organic ingredients that B&P and its roster of chefs and cooks have handpicked for each specialty–to a variety of mouth-watering options. 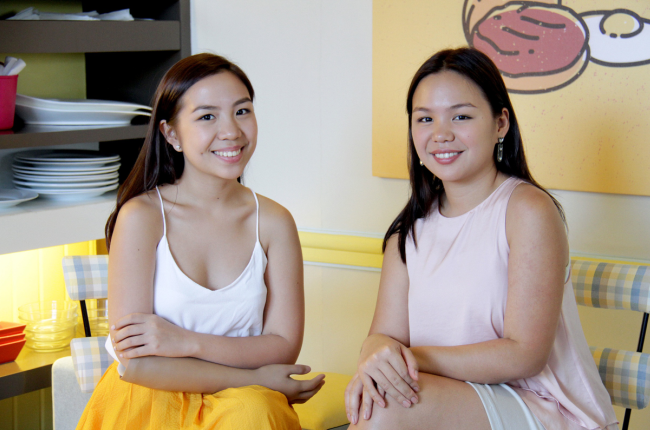 Adding a kind of witty peculiarity is the menu list itself, where most signature specialties reflect quirky takes on the favorite dishes of Bea and Pia, Cravings founder Annie Guerrero’s granddaughters and CEO Badjie Trinidad’s daughters, whose names are the inspiration of the new restaurant brand. Aside from the food, the cozy interiors provide a relief to the very urbanized settings where B&P is located. With ‘home’ at the heart of its service, giving diners a much deserved break from work and everyday activities. The service staffs will not only make you feel welcome–they will make you feel like family, and the restaurant a place you look forward to coming back again and again. 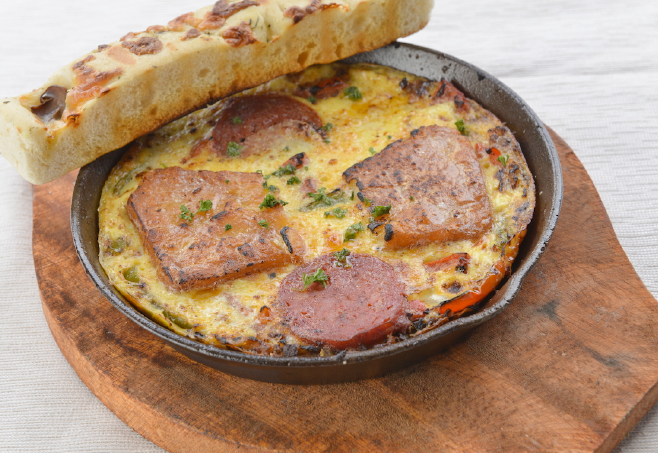 B&P’s updated menu now has a bigger selection of All Day Breakfast items, perfect for those who crave for morning fare and yet want to enjoy them in the afternoon or for dinner. Some favorites include classics like Spam Rice, French Toast, and Classic Pancakes, while the more adventurous would like to try the likes of Mang Benedict (B&P’s take on the classic Eggs Benedict using malunggay pandesal, longganisa, and hollandaise sauce), Protein Bowl (chicken sausage and potatoes in tomato cream sauce topped with sunny side egg), and Salmon Hash and Eggs (fresh salmon sautéed with garlic, onions, and bell pepper, served with two poached eggs and fries). Diners also have a variety of add-ons for their breakfast orders like fresh fruits in season, bacon strips, Nutella, Speculoos Cookie Butter, and many more. You might also want to deck your pancakes with awesome servings of the famous Nanay Pacing’s Peanut Butter and Coco Jam from Baler, Aurora. Coffee connoisseurs are in for a treat as B&P serves cupfuls of Di Bella Coffee from Brisbane, Australia. Full-bodied and perfectly roasted, Di Bella Coffee is sourced from select coffee farms from all over the world. Di Bella Coffee is exclusively carried in the Philippines by the Cravings Group and its establishments, including B&P. What’s more, most of the meat dishes are served in hot plates, like the very tender Primera Tapa (made of premium Angus beef served on a bed of garlic rice, scrambled egg and pickled relish), to which diners get to savor its warmth from beginning to end. Other favorites include Don Malutong (crispy pork belly served with garlic rice, choice of egg and papaya relish), and Bistek Bangus Belly (pan-fried bangus belly, garlic adobo rice, choice of egg and pickled relish). For light fixes, have a generous take on B&P’s version of Lasagna (served with grilled focaccia), Pesto Cream with Crispy Chicken (linguine in pesto cream topped with beer-battered chicken, also served with grilled focaccia). But if you want a truly fulfilling meal, try the Beer-battered Buttermilk Chicken (half-chicken in buttermilk beer batter, deep fried to perfection and served with French toast and homemade gravy), Baby Back Ribs (fork-tender pork ribs with barbecue sauce, served with french fries) and the Pork Chops with Chimi Churri Salsa (tender-grilled and served with red rice pilaf). While the fantastic food selections will certainly keep diners coming back, what also tugs at the heart of guests will be the restaurant’s warm and pleasurable ambiance. Chill-factor wise, B&P rises up as a stylish and very cozy nook. The interiors exude a young-at-heart verve, reflective of Bea and Pia’s sense of quirkiness, making diners feel the energy and reflecting how they enjoy their food. Drenched cheery lemon yellow and nutty brown, the hues combine for a very down-to-earth yet modern allure to the interiors while pops of greens and zesty oranges add for a youthful vibe. Diners can enjoy looking at the nice canvas prints of breakfast quotes, a common feature of which is the iconic egg that best represents the brand of B&P as a breakfast place. Apart from plush lounge seats, another noteworthy design highlight would be the beautiful interplay of textural contrasts which mesmerize the wandering eyes, like childhood trinkets prominently propped on top of wooden utility cabinets. The creativity doesn’t end there, as it extends all the way up the lighting fixtures. With the tremendous success of its first branch at 515 Shaw Boulevard, Mandaluyong City, a second branch is now open at the Il Terrazzo Place along Morato Avenue, a welcome development to the bustling business environment and the large residential community in the Quezon City area as it fulfills deepest longings for quality home-style cooking. Other branches slated to open soon are at the Science Hub 3 in McKinley Hill, Bonifacio Global City and at Cybergate Ortigas.